February 23-28 is National Eating Disorders Awareness Week. This week, there are plenty of events and conversations going on around campus, organized by groups like Campus Recreation, Embody Carolina, Carolina Dining Services, and Campus Health Services, as well as Interactive Theater Carolina and Student Wellness. These events intend to illuminate the prevalence and severity of eating disorders and improve our understanding of their triggers and the ways we can help, while also increasing access to resources, promoting body love, and creating a more supportive environment for those struggling with an eating disorder. Monday, Tuesday, and Thursday, Interactive Theater Carolina’s “What Are You Looking At?” program is back by popular demand! This interactive performance is focused around conversations about body image and the media. More information here! 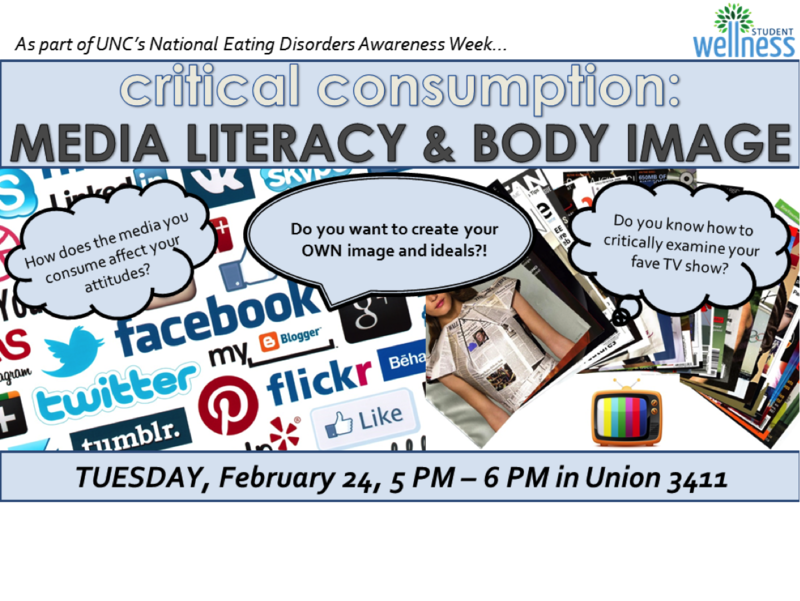 Tuesday, February 24, Student Wellness will host a media literacy workshop focused around body image. Join us in a discussion around the media we consume and how it affects our attitudes about body image, race, and gender and learn how to critically analyze the media in your life!